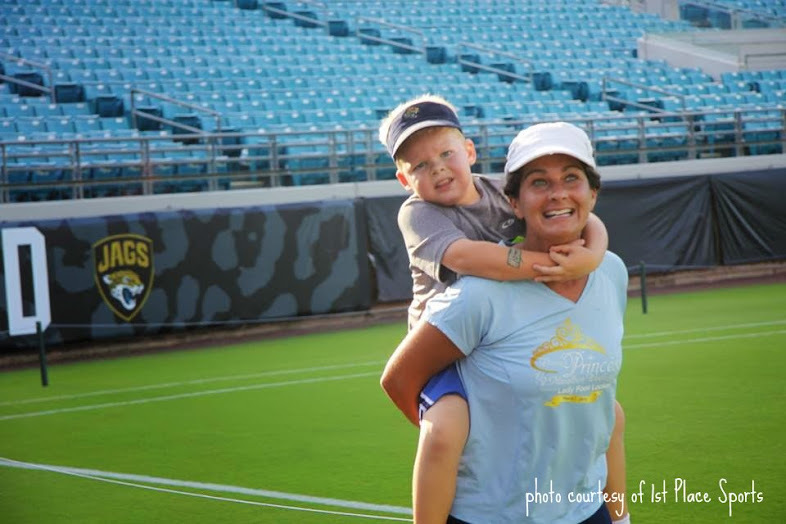 Back in 2013, our family donned our running shoes to take on Everbank Field and had a blast. Three years later, with new bling, a new course and a new finish on the 50 yard line, little man and I were back in the game. To be honest, I really didn’t have any intention of running this. It’s a tough race, incorporating lots of uphill ramps through the concourse and it’s at night (I loathe running at night). Since I have practically zero 5Ks on my schedule and I didn’t have other plans, I figured I would just go ahead and register. I knew that it would be a tough race, on the heels of a long run and a day out at a pool party, but how often does one get to run around a football stadium? Little man has been a bit off running lately, so I asked him if he wanted to do the fun run. He was on the fence, and I decided that I could always just sign him up at the venue. The day of the race, he told me he wanted to do it, so I packed his sneakers and running clothes along with mine. We arrived at the stadium at around 6:00 PM. There was a nasty storm hanging around the area, complete with black clouds and jags of lightning, so we were fairly certain registration would be easy. We were wrong. The line for day of registration was HUGE (in fact, we waited for about 35 minutes, before the race director pulled us and moved us to the front of the line so we could make the 6:45 fun run start – huge thanks to him for that!). I grabbed little man’s bib, and left Mr PugRunner to finish payment. I also left him with my bag, which had my phone, so I was hopeful I would be able to find him again before the start of my wave. At 6:45, we were off. The fun run made a curve around the outside ground floor of the stadium, up a full set of ramps to the very top, and then wound through the concourse, going down some ramps, back up to the top, and then all the way down to wrap around to the entrance to the field. In order to reach the finish line, we had to go around most of the field, and crossed the line at 50 yard mark. So cool. Little man was a beast. The last time he did this challenge, he managed to charm his way into a piggy back ride. This time, he did it on his own, and he ran almost the whole way up the first flight of ramps. Rock star. We were handed water and ushered up the stairs into the seating area, where Mr PugRunner was waiting for us. Little man collected his medal from one of the Jaguars cheerleaders and then we chilled out and watched more people cross the finish line, before it was time for me to head back to the start line. I had signed up for the 7:45 wave – I wanted some of the experience of the lights on the field, without it being too dark and late. I toyed with the idea of switching to 8:15 to be with some friends, but I was also tired and wanted to go home. It made it tough to coordinate with friends, but I was able to hang out with S for a few. At the start line, the race director outlined the course to us. He also mentioned that some of the latecomers didn’t have timing chips on their bibs, so they could either keep track of their time via the race clock or their own personal timing devices, and then report it to the race team at the end. It was a nice gesture for those who wanted to be included in the official results. We started promptly, and I felt very strong going out. I got to almost the one mile mark before starting my intervals – partly because the course was very tight at the start and partly because I felt good. By that point, we had taken care of the ground level part of the race, and were getting ready to enter the stadium. While the weather was overcast and breezy, inside the stadium was nothing short of humid. The air was so thick you could chew it, and I looked forward to the brief moments of relief when we exited the concourse and got back out in the fresh air. We had to climb two sets of ramps: the first set was a straight bottom-to-top go, while the second involved going up partway, around the concourse and then up the rest of the way. It wasn’t awful, but the downhill run was the best! I confess, I did stop at the very top of the stadium to snap this photo of the Hart Bridge (I’ll see you in March! ), but other than that, I kept on trucking. Finally, we were back on the ground, through the field entrance, and I was making my loop of the football field. Mr PugRunner and little man spotted me from above and cheered me on – I loved being able to see them! A lot of people were slowing down to try to see (and get pictures of) themselves on the big screens, but I was more interested in getting across that finish line, so I just put my head down and did the work. No PRs on this night, but I was ok with that. It was good to get out at night, good to run the shorter distance race and good to be outside my comfort zone. rejoined the boys, and then went up the steps to the Bud Zone, where finishers could get their free beer or soda and some food. I met up with a few friends, gave hugs and high fives, and then we were ready to go. It had been a long day and we were all ready for bed. Despite its challenges, I’m glad I rallied for this one. It was good to stretch my legs, get in those inclines and push myself. And it was even better to run with my little guy. I’ve missed it. Do you ever get to run in sports stadiums? What’s the most unique race venue you have experienced? That is so cool! You are leading such a great example for him. Glad you all had so much fun! 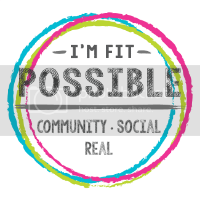 Margo recently posted…Brooklyn Fit Chick Playlist with @Beyonce @OneRepublic #Coldplay and more! I am trying! I think if he’s having fun, that’s the main goal. They had a Spartan down in the Tampa Bay Bucs Stadium and I remember people talking about all the stairs. Not so fun. 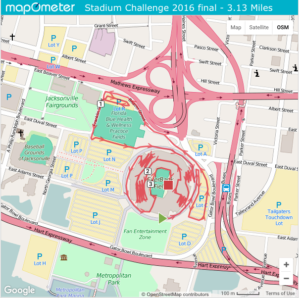 How fun to run a race at a football stadium! And at night! I have a hard time “feeling it” for a night race..so hard to get the nutrition thing down right. I always say this but your son always looks so proud with his medals! It’s so cool that he loves doing this. I had a hard time eating and drinking right for the day (it was especially hard since I was at a party and needed to drink water instead of having sangria), but once in a while it’s ok. The sunset from the top of the stadium was worth it. No, I never get to run in stadiums….and I wish I could!! This looks like a great challenge! Those ramps would be the perfect blend of your running and stair climbing! How much fun is running in a stadium to finish a race! Looks like little man loved it too! You really have some great photos too! I did get to finish in the Manning Center which is a newly built football practice field at Ole Miss. We are Rebel fans so this was just awesome to me! Oh, so cool! We are Miami Hurricanes, but since the old Orange Bowl was demolished, the only place we would have is the new Hard Rock Stadium (Hurricanes share with the Dolphins, which is my favorite pro team). Which I wouldn’t mind, either. Congrats to both of you! Sounds like a very fun event. The Soldier Field 10-Miler here finishes on the 50 yd line of the stadium. The most unique for me though might be the Indy 500 race track. That was so cool. 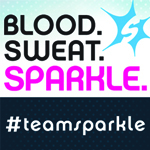 Marcia recently posted…Who’s Up for a #SparklingDetox? We have the Daytona Half Marathon and it ends on the racetrack. I hear that it’s a fabulous experience. One day I will give it a shot! what a fun race!! little man looks amazing in his all his photos – congrats to him as well. I’ve run the Steelers 5K a few times. Love running in the stadium as a fan! It’s so fun to be in the stadium. To be honest, I would love to do this in Dolphins Stadium (Or Hard Rock Stadium, as I believe it’s being called now), but maybe one day. Since I live in CT, land of no sports teams, there are no races like this near me. It sounds AWESOME! I’m so glad you and Little Man both got to get out there. And even better that the Mr was able to come too! Sounds like a fabulous evening together! LOL at land of no sports teams. Poor thing 🙁 We had a great night. Would have been better in the morning, but what can you do? Awww congrats to your little man! he did great, he has grown quite a bit since his race, he looks really young in the piggy back pic! 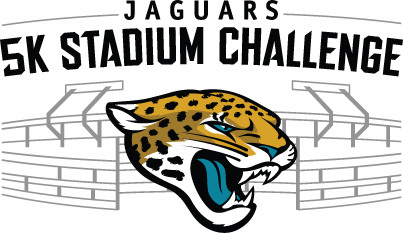 Great job on the 5K – I have never run in a stadium but I can imagine it is challenging. I love the view from the top of the stadium. Those ramps get pretty tough towards the end, especially in the humidity. But the view can’t be beat. The beer was delicious. What a fun and unique event! I love the medal. Looks like an amazing event, I ran in a stadium once and loved it! It was so much fun! And the medal was fabulous! They really upgraded them over the last few years!